Index to DKE "Stories of the Week"
Feet plagued Charles Brannock's nights in the Delta Kappa Epsilon fraternity house as a student at Syracuse University. Spending his vacations working at his father's shoe store, Park-Brannock Shoe Company, on Salina Street, Brannock became aware of the need for a device that would properly measure feet. 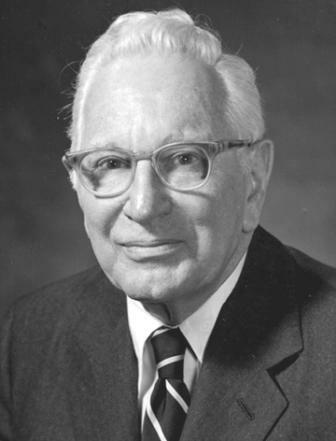 "The shoe salesman, like a doctor, has a distinct responsibility to his customers, because a mistake in the fitting of a shoe, particularly a child's shoe, can definitely endanger the health," said Brannock, according to The Brannock Device Company's "Company Perspectives." breakthrough. A functioning Brannock Device was built from his basic prototypes and his studies of shoes and their sizes. The Smithsonian's National Museum of American History solidified the importance of the Brannock Device to the shoe industry, as well as to overall health care, with its induction into the museum in 1998. The device is able to accurately measure a foot's length, width and arc length all at once, and it debuted at the Park-Brannock Shoe Company, a great improvement on the wooden block ruler that was originally used. The Brannock Device's effectiveness boosted the locally owned shoe store's business, and the shop began to stock uncommon sizes. Park-Brannock Shoe Company grew into a widely recognized, growing shoe store receiving reviews in shoe magazines according the "Company Perspectives." While Brannock originally intended the device just for his father's shop, his invention quickly caught on nationwide, allowing him to open his own company to produce the devices. About 33,000 devices were sold worldwide by 1939, according to the "Company Perspectives." The United States Navy also enlisted the device in 1933 to discover why so many sailors were suffering from foot ailments. The problem was not the Navy's shoes, but how they were fitted. The Brannock Device is the standard foot measuring tool for the world's footwear industry. But few people are able to call the device by name, much less identify its inventor, Charles Brannock. Brannock was born into the shoe business. His father, Otis Brannock, joined with Ernest Parks in 1906 to found the downtown Park-Brannock Shoe Co. in Syracuse, New York. As a Syracuse University student, young Brannock wanted to find the best way to measure the foot. He played around with the idea for a couple of years and finally built a prototype using an Erector set. In 1926 and 1927, Brannock patented the device and created a company to build it. Click here for background on Brannock and a brief history on his invention. The United States Army followed suit in 1941 and had Brannock create a device specifically for fitting army shoes that would measure both feet at the same time to quicken the process, according the "Company Perspectives." Now, 80 years later, The Brannock Device Company in Liverpool, N.Y., only produces Brannock's invention, with minor variations, such as European, female and sport shoe sizing options, for companies worldwide. "The Brannock Device is a trademarked name," said Tim Follett, vice president of The Brannock Device Company. "A lot of people think that it is a generic name for a foot measurer, it has become such a standard of the industry." The company's most recent development was a device aimed at athletes called the "Pro Series," which measures feet sized 10 to 25. The new device was tested on professional basketball players from the Atlanta Hawks and Chicago Bulls, according to the company's Web site. 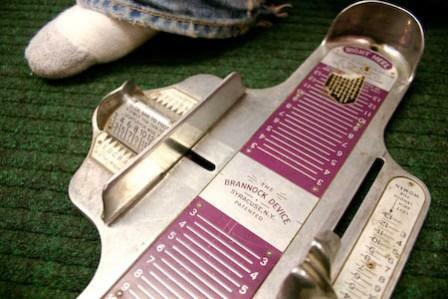 While each shoe company has its own sizing standards, the Brannock Device was designed to overcome that problem. The device measures the actual size of the foot rather than to specific shoes sizes. Follett said the device is most effective when used by someone who has an understanding of their product. "It is more of a tool for a salesperson to use," said Follett. Junior American history and political science major Zack Glick recently used the device to purchase better-fitting hockey boots. "A salesperson helped me and told me that I needed a wider boot and that is why my feet were hurting when I played," said Glick. The Brannock Company has a basic monopoly over the Brannock device market, with only a few companies in China producing similar devices. "Its kind of a niche market," said Follett. "You're not replacing (the devices) all the time. You can only sell so many." Because the market for the devices is so limited, the Brannock Device Company has moved to selling the product more to corporations than individual stores, as it had in the past. The company now works with international shoe companies, such as Nike, Foot Joy and New Balance. "A lot of what we do is put a company's logo on them," said Follett. "About half of our business is that." The company, in Brannock's original tradition, still sells the devices individually. Follett said on average, 10 to 15 individual devices are sold per day, mainly to parents of younger children whose shoe sizes change quickly. Alyssa Carolla, senior public relations major, remembers having mixed emotions about the device as a child. "I remember using it when I was really little, and it was really cold," Carolla said. "The sales guys would jam it really close. I always thought the carpet with the feet on it was cooler." Carolla endured having her feet measured because she loved getting new shoes. She doesn't believe that children now don't have the experience of using the device because shopping habits have changed. "My sister gets a new pair of shoes a week from Target," said Carolla. "A lot of people aren't going to department stores."